The Vishwa Hindu Parishad (VHP), known for its aggressive posturing, has begun distributing a leaflet in one Lok Sabha and nine state assembly constituencies going to by-polls on September 13, asking Hindu girls to be "wary" of well-dressed Muslim boys seeking to “dangerously trap them into prostitution”. Being described as “highly inflammatory” by activists on the social media, the leaflet has already been distributed on a very large scale in two constituencies – Vadodara (Lok Sabha) and Maninagar (assembly) – vacated by Prime Minister Narendra Modi. Modi fought Lok Sabha from two places, but decided to represent Varanasi instead of Vadodara. He represented Maninagar assembly seat as Gujarat chief minister. The distribution of the leaflet comes amidst efforts by the ruling BJP to ensure its candidates win with as big a margin both in Vadodara and Maninagar as that of Modi. In the 2014 Lok Sabha polls, Modi won from Vadodara by 5.7 lakh votes, while his victory margin in in the Maninagar assembly seat in December 2012 was 86,000. Gujarat chief minister Anandiben Patel, on a campaign spree, has said, she wants to win all the 10 seats and it will her birthday gift to the Prime Minister, visiting Gujarat on September 17. 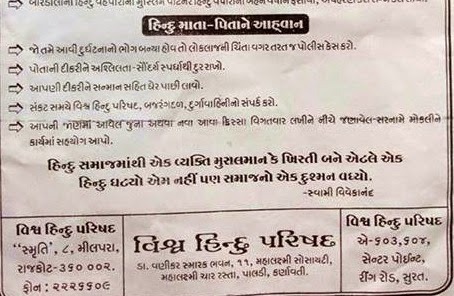 Printed in Gujarat, and having the addresses of VHP offices in Ahmedabad, Rajkot and Surat, the leaflet seeks to quote Swami Vivekanand justifying its aggressive Hindutva stance: “Each person converting from Hinduism to Islam or Christianity doesn’t just mean drop in the number those pursuing Hinduism. It also means that the enemies of Hinduism have become stronger.” However, it does not give the reference of the book or speech where Vivekanand allegedly uttered these words. Part of its Love Jihad campaign, endorsed by RSS chief Mohan Bhagwat, the leaflet has been forwarded massively on social media, particularly Whatsapp and Facebook, apart from being distributed by hand. While Congress leader Madhusudan Mistry – who fought against Modi in Vadodara -- has described the leaflet as the “real face of the BJP”, there is so far no official word about it from the Congress’ state leadership. It has not complained against it to the Election Commission of India either. The leaflet, described by social activists as “scary”, seeks to give several instances on how well-dressed Muslim boys hand around outside colleges and girls in order to lure Hindu girls, adding, Muslims “target” Hindu maidservants working in their households. “Muslim teachers, doctors and lawyers seek to entrap Hindu girls who approach them… The Muslim and Christian population has risen manifold over the last several decades, which is not the case with Hindus”, it points out. Calling efforts to trap Hindu girls a decade-long “international conspiracy” hatched by terrorists like Haji Mastan and Dawood Ibrahim, the leaflet gives a graphic picture of how individual girls were allegedly “ensnared” by Muslims in Ahmedabad, Rajkot, Surat, Bharuch,Navsari and Bardoli. It tells Hindu parents to contact VHP, Bajrang Dal and Durga Vahini offices as and when they come to know about such “dirty tricks”. VHP, RSS and other Hindu sena should improve the hindu religion and hindu girl well-dressed stop loving Jihad all the hindu girl will marry Jihad they will think they are muslim but they as to pray hindu and hindu god because they are hindu and die like hindu and pls stop cutting COW govermnet should improve the HINDU religion in india.